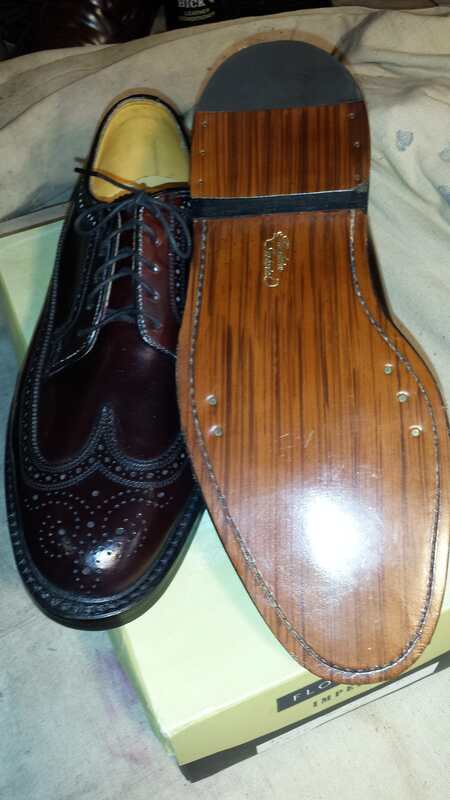 I just got some Dack's camel skin wingtips in walnut (paid a tad more than $8 on eBay). The grain looks a lot like the grain in my camel skins, which I love, BTW. So, I'd guess camel. @mariusscott is your man. He knows more about Canadian vintage shoes than I know about... criminal law. Lovely shoes, would say either camel or perhaps antelope, dacks had some wild looking antelope back then. 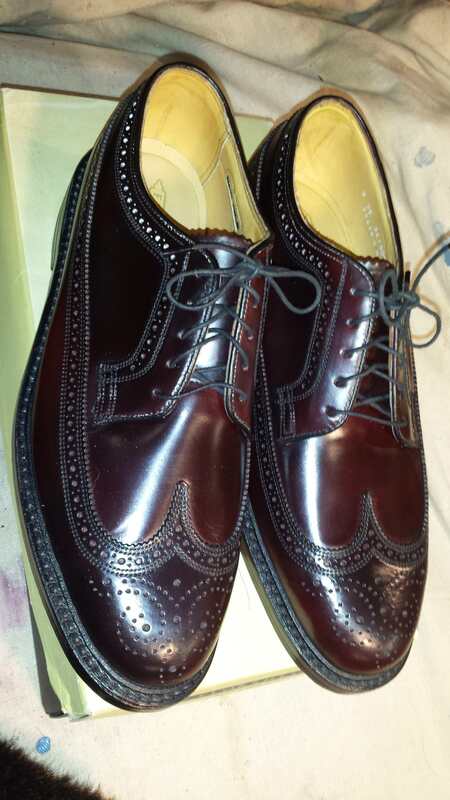 Those are from the Dack's Bond Street period, made by cheaney/church in the UK in the late 50s and 60s. 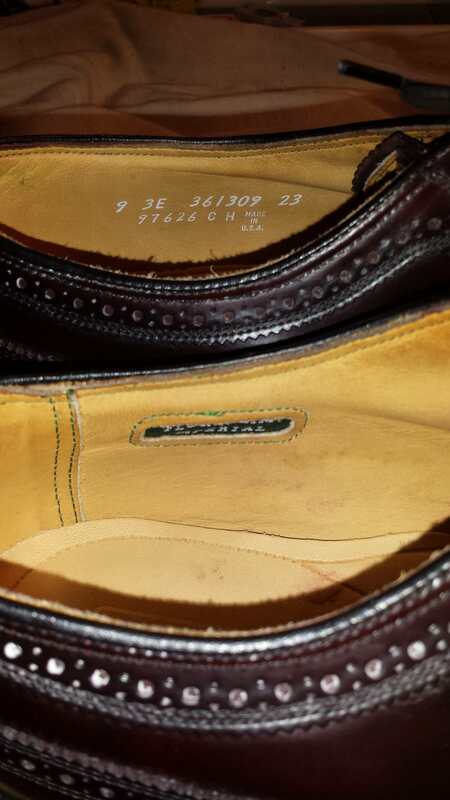 The highest quality line dack's had, and original soles and heels. Great find. They are labelled a standard 9.5D but from this period in time its hit or miss on sizing. Thanks, guys, I appreciate you sharing those details. I found a Dack's thread tonight that I have been reading through. I saw this model referenced as being the Dufferin. The number markings are similar to the ones on (your Etsy site, Marius? ), here, and visually to the ones on page 14 of the Dack's thread. It is so cool to find out the history behind these, and I'm looking forward to sprucing them up. Those turned out nicely! You have to look closely to see any difference in the area the color came off now, and the welt stitch really stands out nicely as you had wanted. Any thoughts on a 2000 AE Shelton in calf? 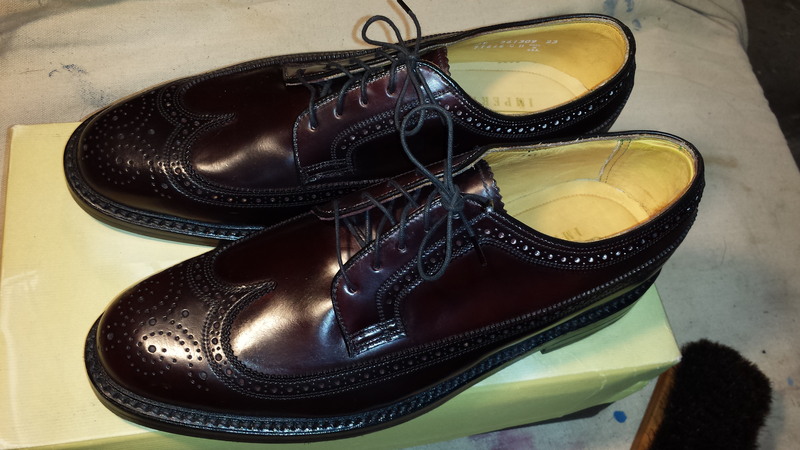 Not sure I need more saddle oxfords, but since these are the calf and not the polished cobbler, I can be swayed. The 511 isn't a favorite last, but I can make it work. I own a pair of those. Mine came with a terrible rubber sole and I almost threw them away after 1 wear. Had them resoled with a steel shank new cork and leather sole. I like them a LOT now. Dacks, Hartt, John McHale, Brown's... all great vintage Canadian brands. 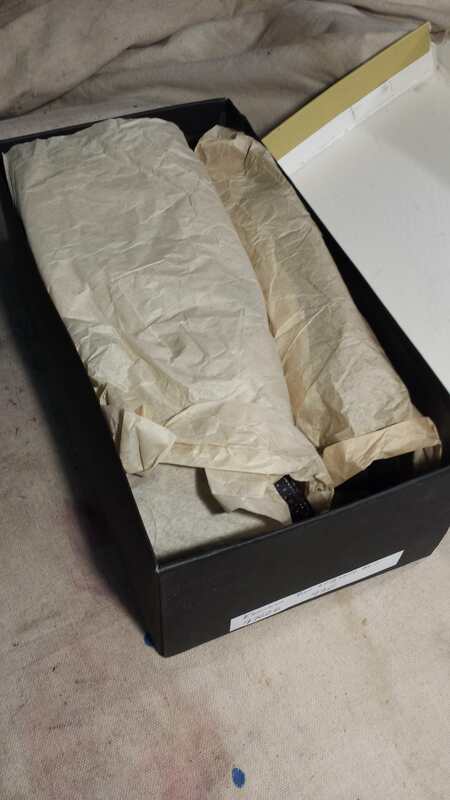 Florsheim, Jarman, and Dexter also manufactured in Canada at one point. Yes, you should get them. 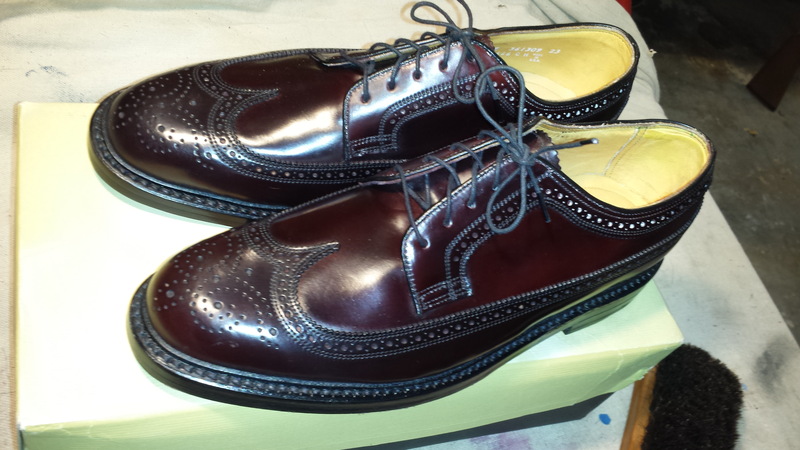 A while back I took my pair to Willie's Shoe Service in Los Angeles and had brass eyelets put in. I vote yes on nearly all Saddle Shoes. Those are good looking! I need more Saddle shoes. Mine are all solid colors (i.e. the "saddle" is not a contrasting or different color). Well, except maybe for a pair of OLD Footjoy golf shoes. Anyway, my vote is go for it. 13A or AA has to be pretty hard to find. Am I the first to respond regarding today's theme? I had two options today. I may change shoes at lunch to show the other one. But, when I think of dress shoes that could survive a Zombie Apocalypse, there is one shoe that jumps to mind. It has to be sturdy, it has to be durable, it has to have a thick sole for stomping, it has to be a proven model and style that has already stood the test of time. I have a few pairs that are older than these. But, not many. And those that are older are probably not quite as beefy as these. 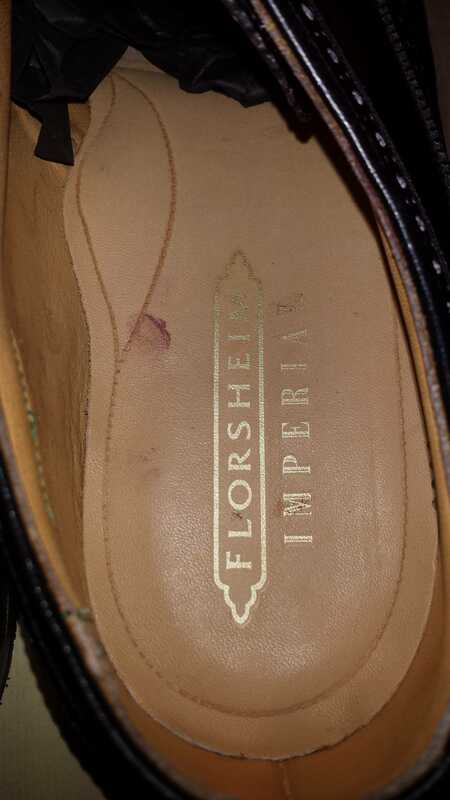 So, I proudly present my Zombie Stomping Apocalypse-surviving-long-wearing-nuclear-war-surviving Florsheim 93602! These are (I believe) from 1965. So, they have proven they can last. The craftsmanship is amazing! I think they have more stitches per inch than 20 modern pairs combined. Always interested in nice conservative suits: Oxxford, Brooks Brothers, Cremeiux 48L and Shoes 11-11.5 shoes (B or C width). I love law related things as well as politics, some sports stuff (Washington Redskins, Missouri Tigers, St. Louis Cardinals) and vintage CAR STUFF (BMW, Lincoln, Cadillac and Vintage). Friday is Zombie stomper day. It didn't take long for me to make a decision. 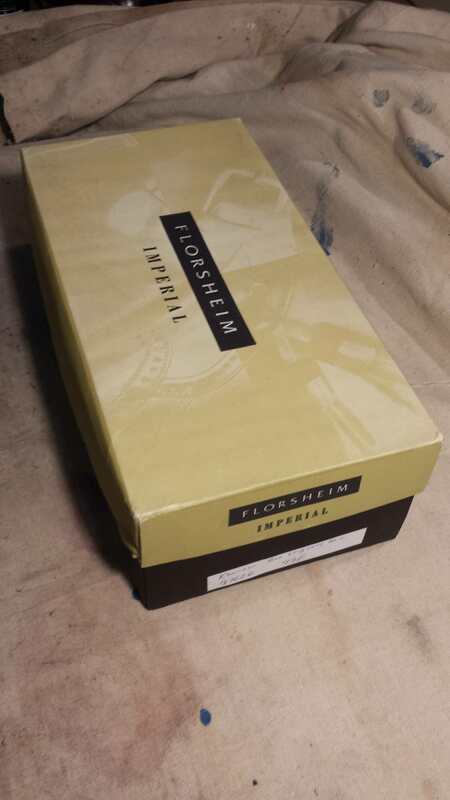 These are my first pair of Florsheim 92604, which I traded with @mariusscott . At the time, I had not read @davidVC 's vcleat.com article about how to date a pair of Florsheim. These are marked DB, so 1981 or 1971. These were well loved by the time I took ownership. They had been recrafted at least once. They had Dacks soles, and Hartt insole. At first, I thought they were Canadian made Florsheim. After reading vcleat.com, and coming across this thread, I realized what I had. I sent these out to be recrafted with JR soles. They are workhorses. The condition of the leather is..... ok. There are tears, rips, and issues. But I keep them conditioned and use them in the rain. I could definitely stomp on any zombie with these, and not worry about wrecking my shoes. I assume in the apocalypse, that I will take my entire shoe collection with me. Have a great Friday and weekend, everyone! Next week's schedule will be posted soon! Next week's schedule, with inspiration and suggestions from the group! Monday - Breaking in a virgin. If you have any pair of shoe, but especially NOS ones, that you have NOT worn, it's time to showcase them. Tell us why you haven't worn this particular pair. @eTrojan gets the credit for this one. Tuesday - Sum of all Fears. Your expertise (whatever it may be) is required to save the world. You have been summoned to present your findings in front of a United Nationals panel on the urgent issue. What shoes do you wear to such a historic event? Wednesday - That mole. You are single. And so is Cindy Crawford (I picked her because @smfdoc talked about her extensively). You throw a hail mary and ask her out on a date. She accepts. You are old fashioned and will take her out for dinner, drinks, and a show. What shoes do you wear to impress Ms. Crawford? Thursday - Driving Miss Daisy. You are the chauffeur for a famous and elite member of society. Your vehicle rotates between a Rolls Royce, Bentley, Maybach etc. You are required to wear the full uniform. What shoes would you pair with this kind of job? Friday - Dinner with David. @davidVC has invited you over to his house for dinner. He wants to showcase his collection, and seek your valued opinion about his pieces, and what he might be missing. You obviously don't want to disappoint. What shoes do you show up with? Why? This is my zombie fighting combo - camo and green Hanovers. Big, chunky, solid. Would do some damage. @suitforcourt , avert your eyes. SFC, you know what you need to do. I am not a paid spokesman. It is just a great read. No doubt, I will live to regret my decision. I will also live to have some/all of you harass/goad/remind me of this life altering moment. But $375 is a lot of money, plus conversion to Canadian $$$, and the taxes. Total would be $443.75 (US). Not chump change. Plus I recently purchased 2 shell pairs (not in NOS condition of course). And a third pair of shells on the way from @JohnAAG . My shoe shelves are now full. I don't want to "get rid" of any pairs. I am learning to be satisfied with what I have. What's that saying... "Love what you have. Not have what you love." I have a lot of great vintage shoes. Mostly due to this group. I would love to have another NOS shell pair. But I don't need it. There’s a joke in my house that mommy will never survive the zombie apocalypse. The kids know that if they want to have any chance of survival they have to stick with daddy. So the idea that any LWB will be sufficient for zombie stomping is completely unrealistic to me. I offer Nick’s Handmade Contender boots, proudly made in Spokane, Wash. (http://www.nicksboots.com). I got lucky on eBay one day when chasing a stray posting for Lucchese boots. Decided to look at “boots”. Who knew there would be something as spectacular as these in a 13 A? These are the same boots used by wildland firefighters (with some slight materials changes). They have a really high arch that took some getting used to, but now that they’re broken in I use them for hiking, camping and yard work. Stomping on a shovel for a big dig, and I feel nothing in the boot. I imagine stomping zombies will be similar, especially if I’m decapitating them with a shovel. These haven’t been cleaned up since my last foray into the yard. Usually a round of saddle soap and Bick 4 keeps them nice and purty.